These machines exist for one purpose only, and that is to create the tubular plastic tamper proof seal that you can see on almost every bottled product in the store today. The way these machines work is that the seal material comes wound on a reel just like a fire hose. The material is tubular already but it is rolled up in a flattened form to take up less space on the reel just like the canvas fire hoses you see the firemen use. The film reel is loaded onto the machine and threaded through a feed system and over the top of a mandrel or wedge block. The purpose of the mandrel or wedge block is to pre-open the film so that it forms an open tubular structure. The correct amount of tube is fed down enough to cover the neck of the bottle and then cutoff to a preprogrammed length by the control system. 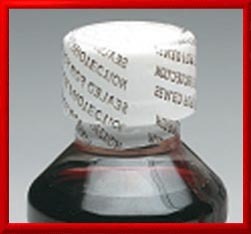 After that the bottle or container gets passed through a heat shrink tunnel that heats only the neck of the bottle to shrink the band tightly around it and thus create the tamper proof seal. The machine you see above was made by Intersleeve. An Allen Bradley SLC 500 Programmable Logic Controller (PLC) controlled it. Union Standard had hired a contractor who was an Allen Bradley PLC specialist to repair this machine because the software was too expensive to buy and we only had this one job to do. He failed and I had to use his laptop and his software to take over and fix this machine. I still retain the original software files on this project to this day.